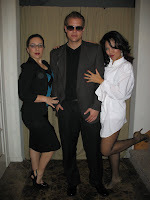 Shameless Self-Promotions: Bond Nite '007. This Night Is 9 Years in the Making. Men in Tuxedos. Or towels. Glamourous women in ballgowns. Or lingerie. Or a go-go costume. Always with fantastic hair and makeup. A catwalk of handsome men, competing for affection. Leaving with someone you didn't arrive with. Since James Bond is always charming, elegant, debonaire, AND totally single, it's only right that singles celebrate him on Valentine's Day. Because whether you're an heiress, a nuclear physicist, a cello player, or a go-go dancer; he will find you attractive. And he will sleep with you. He does not discriminate (or differenciate) women by age, size, race, or education. And any man who can appreciate every woman he meets...well, that's a man I can get behind. 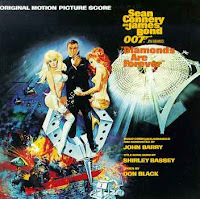 i have never seen James Bond hook up with an overweight woman. this blog is a scam and it has unreliable information. As you can see, I am not friends with people who are fat, ugly, or boring. Everyone in my world (as well as Bond's) is attractive, interesting, and ready to make out if it calls for a good cover to thwart evil. So where were YOU that night, Rhyll? Can we also note that Aubrey looks smokin' hot and has a spectacular body?